Are you searching for professional builders in North London? With many years of experience and a wealth of expertise, Firtree Building Services are the number one choice. Whether you desire a newly converted attic space or an extension to accommodate your growing family, we can help. For more information, call our North London builders today on 0800 270 7764. London is seen by many as one of the most popular places to live. With ample job opportunities, lots to see and do and a fantastic multicultural setting with various eclectic influences, London has much to offer. However, with London house prices being what they are, affording larger more spacious properties can be nigh-on impossible. At Firtree Building Services, our builders in North London can transform and expand your property, saving you time and money moving home. How can our North London builders be of assistance? Here at Firtree Building Services, we pride ourselves on being the finest builders North London has to offer. To that end, our talented team of specialists provide outstanding loft conversions and property extensions. You can learn more about these services below. A home extension is a wonderful way of increasing the space that is available to you and your family. The team at Firtree Building Services are among the finest builders in North London. We are skilled in the art of expanding properties while conforming to the current architectural properties and will aim to meet your exacting specifications head on. As part of our consultation process, we will identify materials that match the exterior look of your home. You’ll often hear that adding square footage to your home adds significant value. If you’re looking to sell your home, then choosing the most exceptional builders North London has to offer is the way forward. From expanding your kitchen to adding on a playroom or study, we can create for you the extension of your dreams. Our builders in North London will work alongside you from start-to-finish to provide a range of services to complete your home extension. The beauty of loft conversions is that they require no planning permission. Our builders in North London are adept at creating conversions that fit seamlessly with the rest of your home. Most projects typically take around 6-7 weeks to complete. 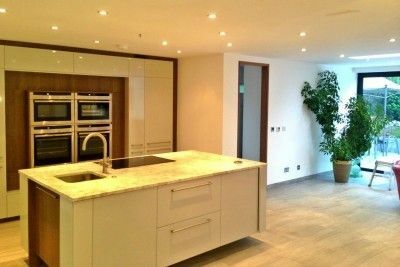 Plus with a team of plumbers, carpenters, electricians and flooring specialists to call upon, you’ll have the convenience of dealing with a single company of North London builders throughout. All work will be completed by our skilled builders in North London, and at the completion of your project, we will supply you with all the necessary building certificates. We also take the time to ensure that your property is left neat and tidy, so your extension or conversion is ready to go. So, if you’re interested in what the most reliable builders North London has experienced can do for you, feel free to get in touch with our team now. What makes us the number one builders in North London? If you’re looking for the most reputable builders North London has encountered, look no further than Firtree Building Services. From single and double-storey extensions to a new loft conversion bedroom complete with en-suite, all projects will be handled by our team with the utmost professionalism. For many years, our North London builders have provided careful thought and planning across hundreds of projects. We can work hand-in-hand with your chosen architect, engineer or designer or as a solo lead on any project. Plus, with our understanding and insight, we can transform any interior, optimising the flow and layout to create extra space and functionality throughout. Our builders North London team can provide all of this while still offering the most competitive prices around. To top it off, we boast the shortest lead times in the industry so when you choose our North London builders for your project, you can expect all work to be completed to your schedule. Best of all is that you have peace of mind as all of our work is guaranteed for 10 years – it is little wonder Which? Magazine named us as a Trusted Trader. If you’re searching for builders in North London, give Firtree Building Services a call now on 0800 270 7764 to see what we can do for you.